When is the last time you had a dental checkup? Most people in the Lafayette area between the ages of 25 and 75 need a dental checkup every six months. If you live in Lafayette and are at higher risk for oral diseases, you should have your teeth checked every four months, or at least three times a year. Come into our office, located at 1140 West S. Boulder Rd, Suite 201 in Lafayette, or give us a call to make a dental appointment. You can visit our website at https://www.bouldercountysmiles.com for more information. Most people in our Lafayette community are in a medium to low risk category. However if you use tobacco or alcohol, eat a lot of sugar in your diet (including lots of soda), or have poor oral hygiene habits, you are likely in a higher risk category and should have your teeth checked by your Lafayette, CO dentist right away. 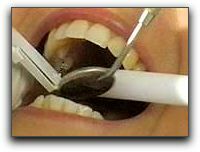 I look at a lot of factors to determine your personal dental hygiene, and your dental outlook for your future. I want you to have the healthiest smile possible so that you can enjoy your teeth for many years without significant problems. If you live in the Lafayette area and are ready to have your teeth checked, please give Gordon West DDS, Cosmetic & General Dentistry a call. Our state-of-the-art dental care in a comfortable environment staff will be ready to get you started with a dental checkup. We also offer cosmetic dentistry services such as dental implants. —Dr. Gordon West, Dental check ups for the Lafayette community. Reach us at 720-862-3630.